1st floor apartment. The Apartment Is Very Well Situated Just A 2 Minute Walk From The Hacienda Riquelme Restaurant, Bar And Supermarket And Pro Shop. 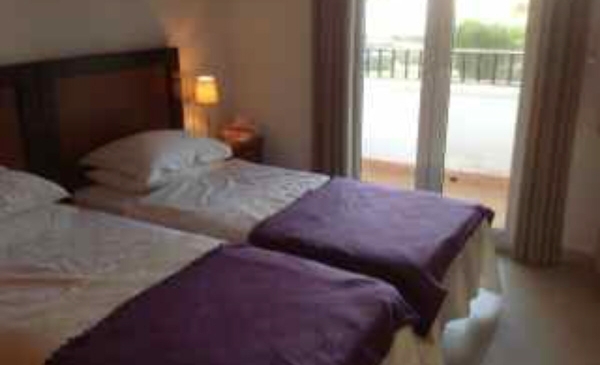 The Resort Is Just A 20 Minute Drive From San Javier Airport And To The Many Blue Flag Beaches On The Mar Menor And 3 Minute Drive From The Local Village Of Sucina. 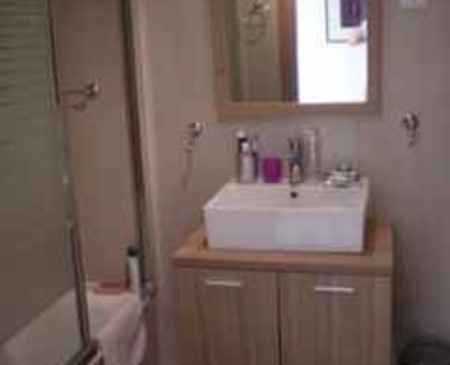 The apartment is very well furnished with all mod cons including TV with multi channels and free wifi. There are fitted wardrobes and drawers in the bedrooms and each room, including the lounge, has a ceiling fan. I’ve tried to make this a home from home, not just a basic rental property as I also spend time here with my family. There is a telephone in the kitchen but only for calls inside the resort and Polaris World network. 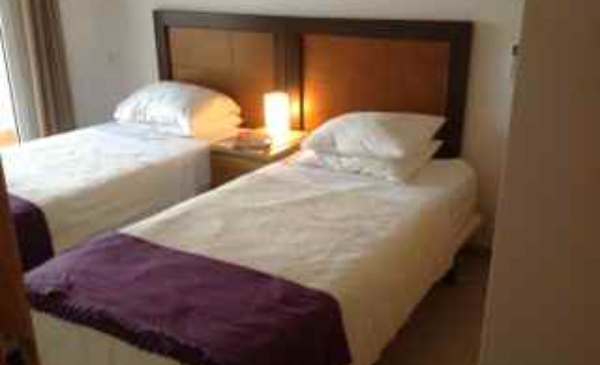 There are twin beds in each room but these can be zipped together to make a double. 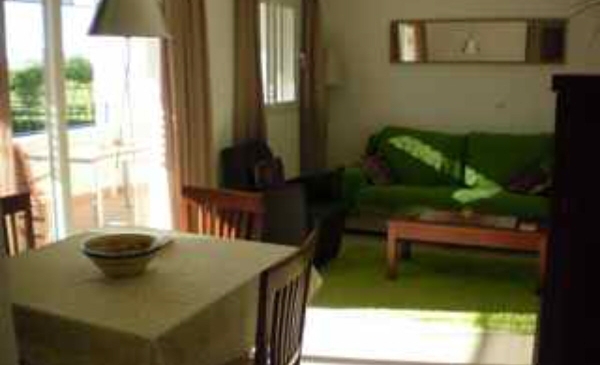 The apartment is light and airy and very homely and comfortable. 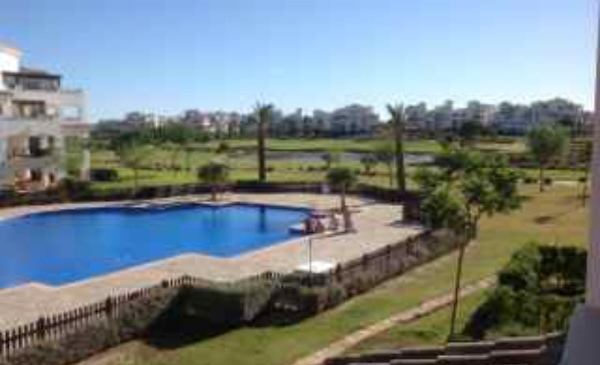 Outdoors The apartment has excellent views over the large communal swimming pool and 11th fairway. 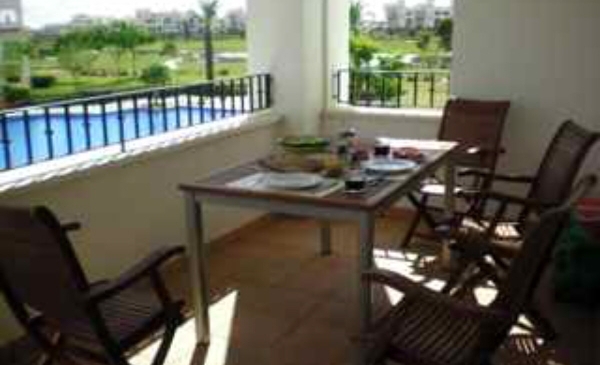 One of the best features is the large balcony, making it excellent for al fresco dining. Or for a change, you can take a short stroll up the original Hacienda Riquelme which offers an outside bar/terrace and restaurant. 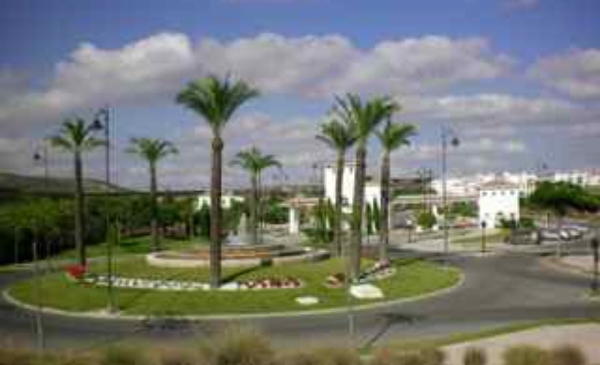 There are plenty of areas to visit including Murcia and Cartagena cities, the Mar Menor with it’s many splendid beaches and towns and the bustling town of Torrevieja and all the superb beaches along the coastline. A car is advisable to fully enjoy the area but it’s not essential if you want to relax or have a walking holiday. My key holder offers a taxi service for the days you do want to venture out. There are numerous golf courses too. If you are a golfer, you’ll know them but first there is Hacienda Riquelme on your doorstep and La Torre and other courses in the Jack Nicholas Trail, not to mention Las Ramblas, Campoamor, Villa Martin, La Manga. Tempted?